"Had this at a 4 star restaurant in my teens. Loved it so much, Mom got the recipe from the chef so she could make it for me. It has become a favorite of my kids, too. Now they know how to make it! This is not your lite chicken Marsala variety! Serve with oven-warmed French bread." Melt the butter with the olive oil in a large skillet over medium-high heat. Pan fry the chicken breasts until golden brown on both sides, 5 to 7 minutes per side. 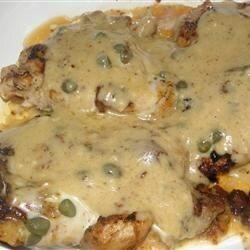 Place 2 ounces of mozzarella cheese on each chicken breast, then sprinkle parsley and capers on top. Reduce heat to medium, cover pan, and allow cheese to melt, about 3 minutes. Transfer the chicken to a large baking dish, and cover with aluminum foil. Keep the chicken warm in the preheated oven while you finish the sauce. Whisk together the cornstarch and water in a small bowl; set aside. Cook and stir the garlic over medium-low heat in the same skillet used to cook the chicken until fragrant, scraping up any bits of chicken and cheese, about 1 minute. Pour in the white Zinfandel wine, and simmer for 2 to 3 minutes. Add the heavy cream and bring to a simmer, stirring constantly, until the sauce begins to thicken. Gradually stir the cornstarch mixture into the cream sauce until thickened. Season with salt and black pepper. To serve, pour the cream sauce over the chicken. To warm French bread, cover the loaf tightly with aluminum foil, and allow to warm in the oven while you finish the recipe. I used a red Zinfandel and I do not like any wine but it was great. Loved this, it was easy and even though I used red Zinfandel instead of white, it was great. My husband even liked it and he always complains about chicken dishes. Loved it! I will make this at least twice a month. loved it! Will try again over a different pasta. Was delicious! My hubby loved it too. Cooked it exactly as called for. Was tender and flavorful. I may cut back on the oil next time, as it seemed like a bit much.